One thing I love about visiting craft supply shows is that you always find something different. I recently bought some Cosmic Shimmer Pixie Powder in the colour Firework. Pixie Powder comes in a small plastic bottle a bit like a glitter glue. The product itself is a mix of different coloured dye and mica powders, that you can apply to wet paper. The powders spread and blend to create a coloured paper that is totally unique. Did I know how to use it? No! but that’s half the fun. I decided to combine this review with a tutorial on how to use Cosmic Shimmer Pixie Powder and what to do with the finished results. 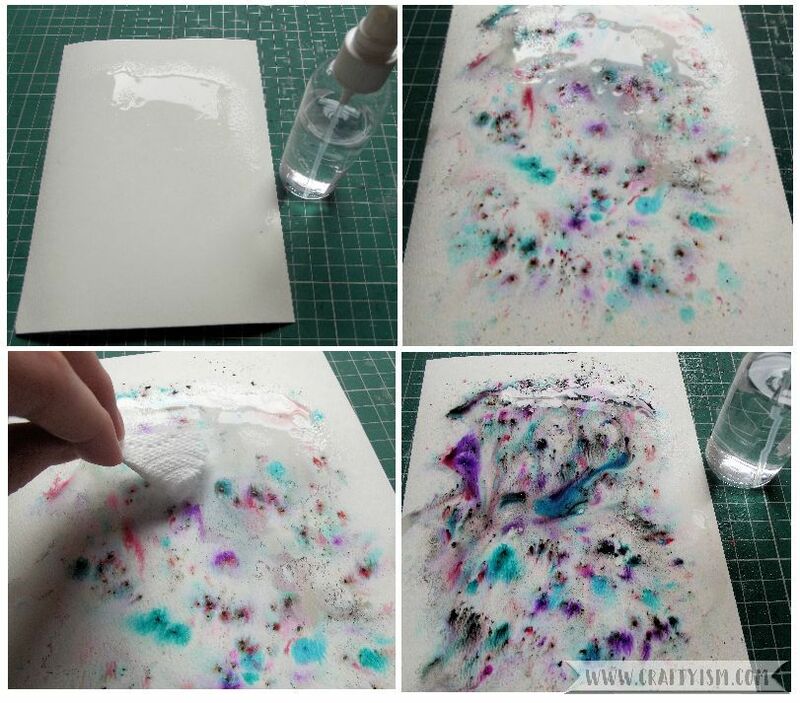 The Pixie Powder bottle says that you can apply it to wet paper and then either spray or brush on more water to create the coloured effects. I decided to start with a brush. After wetting the paper, I squeezed the bottle and puffed the powder onto the paper in a few different areas. Next I used a large wet paint brush to add more water onto the paper. This seemed to make the colours very muddy and they puddled in the pools of water. The second technique says to use a spray bottle to mix the power. I decided that maybe squeezing out the powder meant that too much product came out and made muddy colours. This time, after wetting the paper I tapped on the bottom of the Pixie Powder bottle so that just little flecks of colour came out. I then took a piece of tissue and dabbed at the areas of pooled water. Lastly I sprayed the paper with water to mix up the colours. I think this technique worked a lot better. These are the dried results. The top image is the paper I used with the brush. The bottom image is the paper that I sprayed with the water bottle. I much prefer this second technique. You can see all the different colours clearly and it covered the whole of the paper rather than pooling in the middle. Overall I think the Pixie powder looks really interesting. It dried to a pastel finish and I like that each time you use it, it will look different. I used the finished Pixie Powder paper to make a card topper. 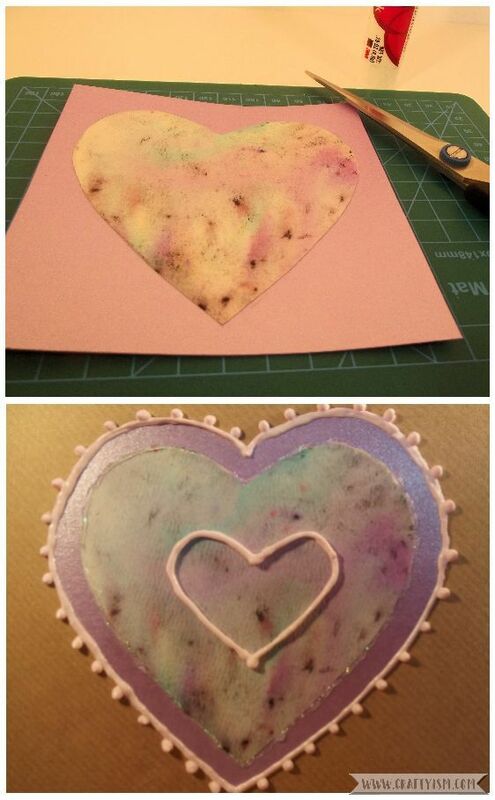 After cutting out a heart shape from the paper, I stuck it onto a piece of card that picked out the purple colours in the Pixie Powder. Then I cut out the heart shape again and stuck it onto the front of a card. Lastly I used puffy paint and glitter glue to outline and add patterns to the heart. Cosmic Shimmer Pixie Powder is a fun product and it comes in loads of colours. I think it would be great to use as the background of mixed media art pieces, or just to create a coloured paper like I did here. Have you ever used Pixie Powder? I’d love to know how else to use it, so be sure to comment with any tips.